The Most Surprising Health Wearables Trend of Q2 2017? I read this article and found it very interesting, thought it might be something for you. The article is called The Most Surprising Health Wearables Trend of Q2 2017? and is located at https://hitconsultant.net/2017/07/10/health-wearables-trend-q2-2017/. One of the stories that is gaining traction in the health wearables space is the reality that sensors are becoming less expensive and increasingly commoditized. It’s no longer enough for health wearables makers to leverage better sensors to attract consumer interest. Instead, they must develop more holistic offerings with software that makes wearables smarter and more useful. This is one reason why wearables makers in the United States, India and other parts of the world are focusing increasingly on AI-powered devices. You may have heard of the potential for Apple’s AirPods to become a Siri-powered high-impact wearable. And, Amazon’s Alexa is being integrated into many different devices currently. Yet, for all the talk about the commodification of sensors, there are still a few areas where they could provide enough of a differentiator for wearables makers, in both the consumer and clinical worlds. One surprising area, is in diagnostics, specifically sweat sensors. In fact, largely under the radar, the sweat sensors market has not only matured rapidly, but is attracting increased investment as these technologies move quickly from the lab to commercialization. 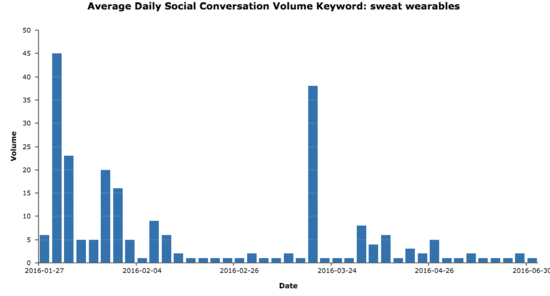 Analysis of emerging technology and digital health online and social media content reveals just how quickly sweat sensors (and speculation about their potential impact on the wearables market) has risen to prominence. 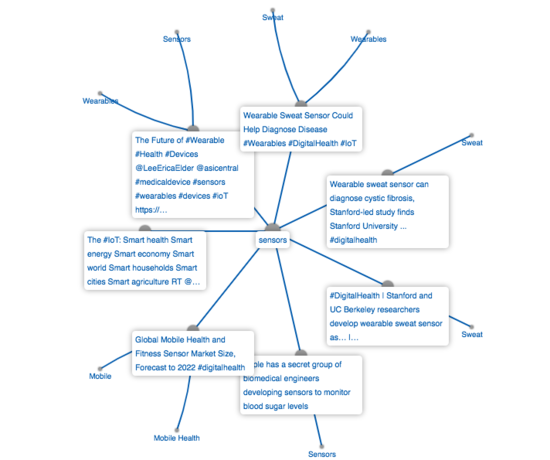 Below is an Innovation Map produced via our DigiHealth Informer intelligence platform showing some of the themes that dominated sensor-related online content during Q2 2017. What’s immediately apparent is just how much sweat sensors captured the digital health ecosystem’s attention, with references to a Stanford study looking at how they could help diagnose disease rising to the top. 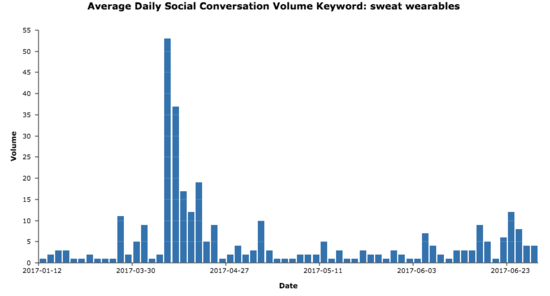 Interestingly, despite a spike in sweat sensor-related conversation during the first half of 2016, these devices attracted less attention throughout the year. In contrast, in 2017, we’ve seen both jumps in attention and consistent references to this technology during 2017 (see charts below). -Researchers at King Abdullah University of Science and Technology in Saudi Arabia, created an inexpensive “paper watch” using flexible sensors that have the ability to measure body temperature, sweat and blood pressure. -Teams at Purdue and Northwestern created patches that measure hydration and could even on day facilitate bloodless screening for diabetes. Startups and investors are paying close attention and are quickly commercializing sweat sensing technology. Here are just a few of the companies that have attracted investment and are working to capture the sweat sensor market. -Kenzen ($5 million raised): This firm delivers real-time insights using patented biosensors. –GraphWear Technologies (Took part in the University City Science Center’s Digital Health Accelerator): This company is creating SweatSmart, a patch that detects biometric data to aid workouts. Some experts believe sweat sensors could take health wearables to the next level, especially from the perspective of providing critical medical and wellness-related data. Only time will tell whether this prediction comes true, but it’s clear the sweat wearable subsector is advancing rapidly. Fard Johnmar is a digital health futurist, strategist, researcher and inventor. He is also founder of Enspektos, LLC a global digital health innovation consultancy, which developed the DigiHealth Informer market intelligence and analytics platform.